Just 5 weeks, start to finish, and her MAQ score dropped from 49 (severe) to 11 (mild). Miley, a beautiful young lady, age 20, had a very positive and upbeat disposition. She had mild misophonia starting somewhere from age 6 to 9. It became severe in the early teens (12-14). 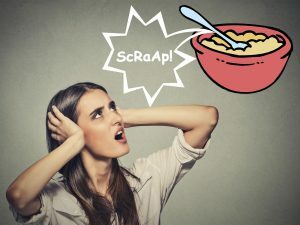 Based on her responses to the Misophonia Assessment Questionnaire (MAQ), her misophonia would be rated “severe” with a score of 49 (63 maximum). She decided to try the Neural Repatterning Technique (NRT) treatment with Tom Dozier’s guidance. She used the Trigger Tamer app on her iPhone and met with Tom each week via the internet. She was addressing specific trigger sounds that occur in her home by a parent. These sounds bother her when other people make them, but especially by her parent. While she was getting the recordings needed for the NRT / Trigger Tamer treatment, she also practiced Progressive Muscle Relaxation (PMR). This is likely contributed to her quick response to treatment. Her first trigger was the scraping of a spoon on a bowl. Her reaction to this dropped greatly after only 5 session with the Trigger Tamer (30 minutes each). She then started working on a chewing trigger. After only 4 sessions of that trigger, her reaction dropped sharply. Such quick response to treatment has been seen in other patients, but is unusual. Her overall MAQ score dropped form Severe to Mild (49 to 11) in just 5 weeks. This included 2 weeks to have the orientation session and prepare the materials for use with the Trigger Tamer, and then 3 weeks of treatment. Is she cured of her misophonia — No. She still has other triggers that she will need to work on, and she plans to do that when she returns to university in the fall. For now, her immediate triggers are mild. Best of all, she knows how to apply the NRT treatment and use the Trigger Tamer to address the other triggers in her life, and she knows she can call on Tom Dozier for help if she needs further guidance in the NRT / Trigger Tamer treatment process.